A project that would normally take a whole day with manual calculations, is now being finished in a couple of hours, hence they have been able to take up more projects, residential projects as well as other projects in the tertiary sector. Rexel, whole sale dealer and distributor of electrical material proposes turnkey photovoltaic installations (panels, inverters, AC-DC converter boxes, cable trays, electrical distribution closets, etc.) and maintenance service. In 2011, the group invested in solar calc™. With their OEM partner Solar World and their partners : sub-contractors, electrical installation commissioners and switchboard installers, Rexel has completed 500 projects per year for individuals, about 6 projects per year for 36KW and 2 or 3 projects of more than 400KW. 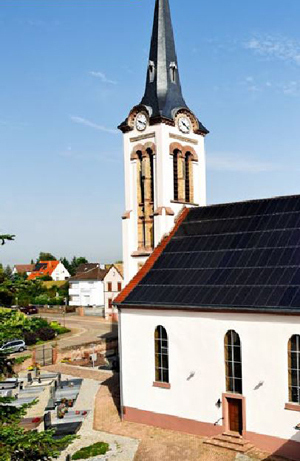 Examples of projects made with solar calc™: Eperon Equitation Club at Kochersberg, PV installation on the roof of the Saint-Pancrace church at Griesheim-sur-Souffel in Alsace which, in 2010, won the first Quali’EnR prize for quality. Archelios CALC can bring to great increase in productivity. « Before a dimensioning study, with all the manual calculation, it would take me a whole day. Today, it’s done, within two hours! solar calc™ can create all the documentation and schematics needed for the verification agency’s approval. » If the user does not make all the schematics himself, they are provided by the installers he works with (like Eiffage, Ineo, Actemium …). « With solar calc™, it’s clear and concise, we know where we are heading », concludes Franck Schalk. « Trace Software’s experience in electrical calculation is a plus. solar calc™ is known in the photovoltaic circles and is used in Small and Medium scale Businesses (SMBs). I know that the results are trust-worthy, verified and regulated. It’s reassuring! ». * Trace Software International acquired the software Archelios from the Cythelia company in march 2015 and Solar calc became archelios calc™. Any questions, any requests for quote or trial version?